Our branch fitting systems address a plumbers two fundamental installation requirements; a leak free, permanent un-demountable fitting system for often concealed plumbing connection, and a simple demountable threaded system for connection to pumps, valves and appliances. Using hydraulically closed press fittings perfectly replaces soldered copper and gives much better security than plastic push fit plumbing. A simple threaded compression system connecting to all standard UK sizes completes the requirement. Working to the strengths of MLCP, i.e. bending by hand without ‘spring back’ virtually eliminates the need for elbows, this means quieter systems by eliminating the noise of water hammer. Multi-layer composite pipe is also delivered hygienically clean and does not ‘fur’ or ‘scale’ producing much reduced maintenance costs. Its 100% resistance to corrosion is a huge benefit in soft or acidic water. We offer a unique range of metal press fittings to create permanent non-demountable systems from sizes 16-32mm, which with the introduction of our patented ‘D’ ring construction makes for the most secure plumbing connections. To offer our customers a complete range we also have simple compression connectors to connect to 15mm, 22mm, and 28mm copper systems. Our MLC pipe systems are available in 5m straight lengths from 16 – 63mm, and pipe coils from 12 – 32mm. 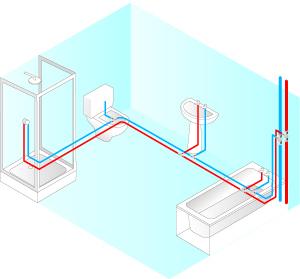 Why use Maincor pipe and fittings for branch plumbing? Quicker to install – Press and compression fittings are quicker and easier to install than soldered copper joints. High quality fittings – our patented ‘D’ ring construction makes for the most secure and reliable plumbing connections. No hot works on site – Improving health & safety and reducing the need for ‘permits to work’.